TORCHx’s mobile CRM was a bloated, fully-featured responsive website that was difficult to use and didn’t support the needs of real estate agents who are on-the-go. 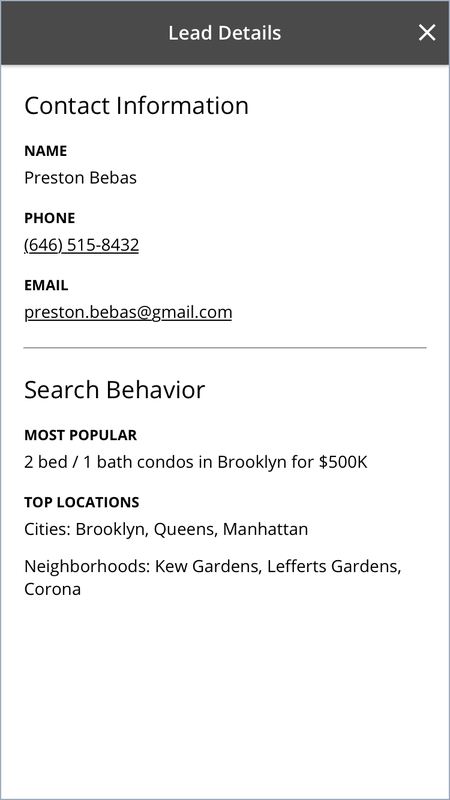 We set out to improve it so busy agents could quickly switch contexts and respond to customers when they’re running between showings or at an open house. This project lasted about 8 months, since it was running alongside 3 other initiatives and we had to hit the pause button a couple of times. I worked closely with a Product Manager and a Lead Software Engineer throughout the entire process. In early 2017, our engineering team was fully devoted to resolving our product's technical & infrastructure problems, which was the #1 priority for the business. This led us to explore other ways we could provide value to our customers, outside of those constraints and our 2-week release cycle. Other than solving usability issues, we felt that an improved mobile website could really help our customers manage their client relationships on-the-go. This aligned with the top unmet need from our quantitative survey, "minimize the number of leads that fall through the cracks," so we felt confident in moving forward with this project. 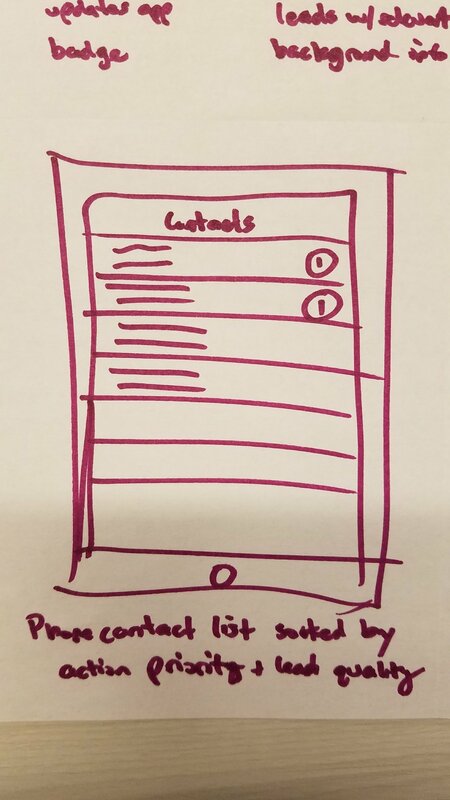 Additionally, one of our lead engineers, who had experience developing mobile applications and websites, had some time that he could dedicate towards building a lean, functional prototype we could use to test hypotheses. Now the question was: what do we release? Finding a minimum "learnable" product. The first step was to put something in the hands of our customers and learn from it. After conducting research, the next step was to generate ideas, align on what we wanted to test, and come up with a more focused hypothesis. I facilitated a design studio with participants from Product Management, Design, Product Marketing and Engineering to ensure everyone was bought-in, engaged, and involved in the product development process. We voted and aligned on testing a notification-driven experience that would alert agents of new leads and incoming messages. The team went through a few story-mapping exercises to find the "thinnest" slice for our first test. That way we could more quickly build a testable prototype, and really focus the test on a risky hypothesis. Clients using the new mobile experience respond to more texts in less time, and spend more time in the CRM than those without the new experience. This really helped us hone in on what features we needed to build into the new experience so we could properly test our hypothesis. 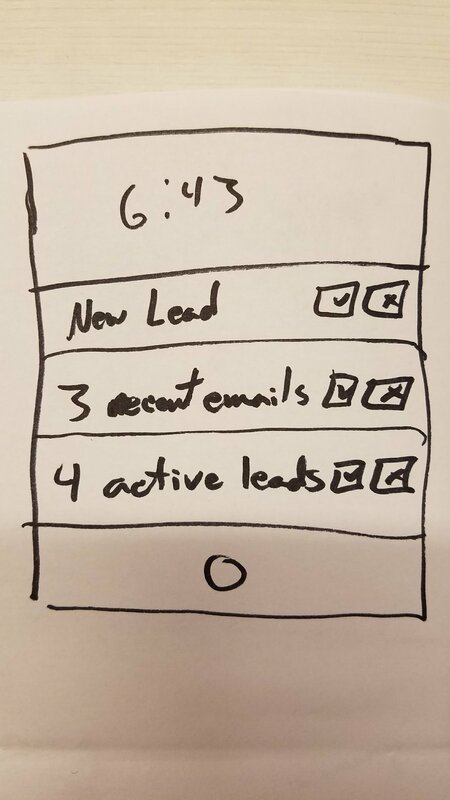 The final process flow would notify users of a new message via SMS, automatically log them into the mobile CRM with the tap of a link, and drop them directly into the conversation with their lead where they can easily respond. 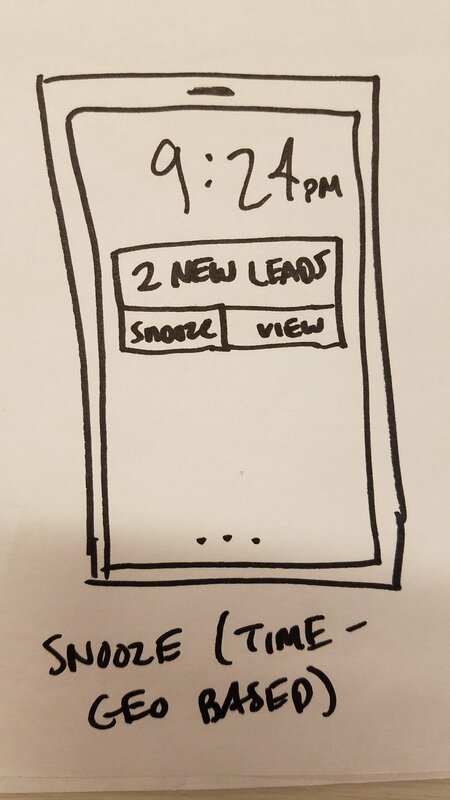 At this point I was working closely with our lead engineer to implement these designs, make small tweaks to the experience, and resolve gaps that we hadn't fully accounted for (e.g. what happens if a message fails to send?). I also created a research & testing plan with input from Product, Engineering, and Data Analytics teammates so we could track progress during the test. We decided to start with an alpha test so we could iron out any final technical or UI bugs before rolling out the experience to a larger population for a beta test. ...And this is when we failed. We recruited 5 clients who were open to testing the updated experience. We "turned on" the new experience for these 5 clients, and waited. We monitored usage data and text messages sent to these clients through our platform. We weren't seeing any usage or text messages come through after a week, so I decided to reach out to these clients. As it turns out, in that 1-week timeframe they hadn't received text messages from potential homebuyers. They had been texting leads that they were already nurturing for some time, but those conversations were taking place in their native SMS applications, not through our platform. The test relied on our clients getting new leads, and we couldn't guarantee that would happen within a reasonable timeframe for such a small population of users (5 clients). We waited another week, and still nothing happened. 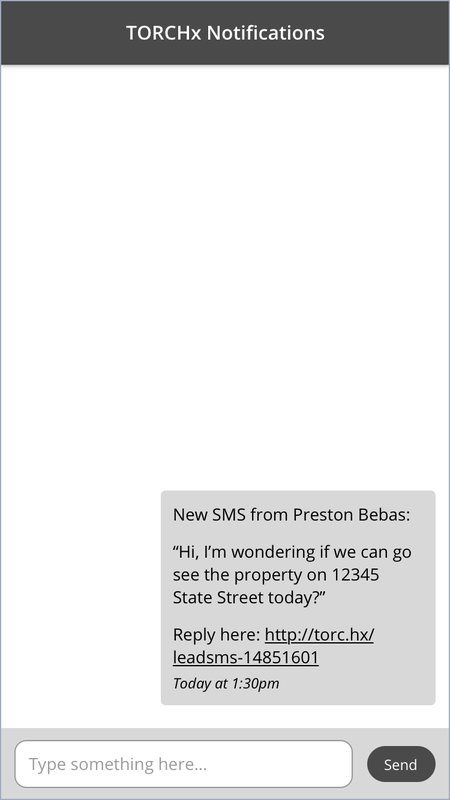 At this point we had to decide whether we'd continue waiting, or expand the test to more clients who were receiving text messages from potential homebuyers more regularly, or hit the pause button. We ultimately decided to hit the pause button because our lead engineer, who was the only technical resource on this project, had to switch gears and dedicatea 100% of his time to technical & infrastructure problems. Test design is crucial to successfully testing a hypothesis. Sounds quite obvious, but we didn't foresee how heavily our test relied on external variables (like clients receiving a text message), and thus we didn't bake in enough time for the test to run properly. Getting quickly to a testable prototype helps mitigate risk and development costs. While the time we spent ideating, story-mapping, and iterating on design concepts was valuable, we should have built a testable prototype sooner, so we could more quickly learn if we had to shift expectations around how our test would work. Spinning up a lean test with just one resource is very risky. The intent was pure and good: despite limited engineering resources, we wanted to find ways to continuously provide value to our customers. While we did learn about our customers throughout the discovery process, the risk came back to haunt us as our only resource got pulled into a more time-sensitive, business-critical project. I was disheartened, but this pushed us to keep looking for ways to deliver value to our customers through experiences that didn't rely on the limited engineering resources we had at hand. This was the silver lining, since it led us to redesign our onboarding process which ultimately had an incredibly positive impact on our customers and the business. You can learn more about that project here.